Moda has invited me to participate in their Moda Cutting Table Blog to talk about one of my most popular rulers—the Easy Dresden. Last year Easy Dresden created quite a buzz in the industry. The Salt Lake City Modern Quilt Guild sponsored a contest using the Easy Dresden, and fabulous entries came pouring in. It was amazing to see the creative ways in which quilters used this very simple tool. Go to www.slcmqg.com to see some of the quilts. I developed Easy Dresden 15 years ago when I was trying to “fix” some vintage Dresden Plate blocks. They didn’t lay flat because the angle of the wedge wasn’t correct. If you remember from your geometry classes in school that you need 360 degrees to make a circle. Anything more or less will not give you a flat or complete circle. I could not find an accurate template; especially not a template that I could use for rotary cutting. So, I made my own. I chose to use an 18 degree wedge as it would have 20 wedges in a circle, or 5 in a fan. I also chose to make it mult-sized so you could make everything from a miniature quilt to a single ring for a table centerpiece. Easy Dresden was the result! Easy Dresden is a simple tool. You don’t need diagrams, long involved instructions or even a pattern to use it. You can use Easy Dresden to create Dresden Plates of all sizes, Grandmother’s Fans of all sizes and also large Tumbler quilts or tiny Thimble quilts. The directions with the tool and on the website listed above have tables that tell you what size finished block different size wedges will yield. 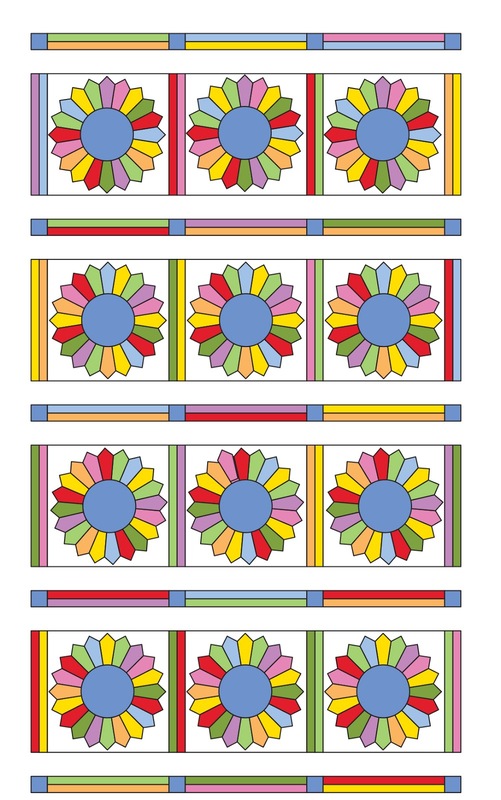 You can easily make the size block/quilt that YOU want to make using these tables. Create your OWN pattern! If you prefer a ready-made pattern, here is “Sunday Best”, a free pattern for you to use. Below find a few more photos for inspiration! Or, go to my website: www.feedsacklady.com for patterns. I will be giving away one of my rulers to one lucky winner! Previous Previous post: Back to BasiX! This would be a great tool to have in my ruler collection. Thanks for the giveaway and for sharing the photos of how it can be used. Mine would be my seam ripper, I use it all the time. I love my glass head pins. Gotta be the seam ripper 😉 I’d love to try a dresden quilt with this ruler! rulers. they make it so much easier to make compicated squares. this dresden ruler would be great! I’ve owned an easy plate ruler for a year now … A Dresden quilt is on my list! Thank you… My favorite notion is for appliqué work and its a great little shirt magnet and lanyard to attach to my scissors. I am constantly loosing my little snips and this tool saves me much time during needle turn appliqué. My favorite “tool” is my Gammill quilting machine! I used this fabulous ruler to complete my version of the Dresden Doilies quilt as featured in McCalls Quilting magazine. I loved using it. I would have to say that my favorite notion right now is that new-ish seam ripper with the “eraser” end which is great for picking up the bits of thread after ripping. Rotary cutter is my favorite. So much faster than sissors! My fav tool is a good ruler! all types and sizes. They make quilting so much easier. Thanks for the chance! I do have to say that I love my EZ Dresden ruler so much that I already have 3…yes THREE of them! Do I need another one…maybe, I could use it when I cannot find the others…LOL! I actually love all my rulers but use this one a lot. I think my favorite notion is my thimble! Love how pretty it is and it protects my finger when doing handwork! Love all the ideas with the dresden! Thanks for the chance to win! Rotatory cuttter and mat.It`s easy cut fabrics with them.Thanks for the chance!! My favorite notion is the rotary cutter. My 60mm ergonomic rotary cutter is my favourite notion, it makes cutting lots of fabric so easy. Thanks for the chance to win. My favorite tool is my rotary cutter. Can’t imagine cutting fabric without it. Thanks for the giveaway. My favorite quilting notion is my rotary cutter. I can’t imagine cutting accurate pieces without it. My fave notion is any ruler that make my quilting quicker and more accurate! I would have to say my favorite tools are my rotary cutters and self-healing mat. What would we do with out them and these awesome rulers you all are making for us. Thanks for this great giveaway! I’m just learning about rulers and really liking them. enough. Thanks for the chance to win. My favourite notion is my rotary cutter, without it I couldn’t possibly make any the quilts. I like my seam ripper that has a little blade. I love my ergonomic rotary cutter! thank you! I love my EZ Dresden ruler. I have used it for so many projects. I love that I can make a classic or modern design and it comes together quickly. Thanks for such an easy-to-use ruler! My favorite would be my rotary cutter but the one I use the most is my seam ripper! I love my new Splash rotary cutter–it makes it so fast and easy to change the blade that I may do that more often now! I’d go crazy without my rotary cutter (which works great with neat looking new rulers)! My favorite notion is my seam ripper. I make a lot of mistakes!!!! I think mine would be my rulers! I wouldn’t be able to do what I do without them! My favorite notion are my mini scissors. They are so convenient to hang around my neck (on a chain). I love them. Thanks for the chance to win. I have to have a rotary cutter and seam ripper. thanks for the giveaway. I’ve been wanting to create with this ruler. Endless possibilities. I love tools, so it is difficult to select my favorite. But, I guess after the rotary cutter it would be my pair of micro-fine tweezers from Filmer (bought at IHAN). They help to pull out the finest thread and very handy when re-verse sewing/machine embroidery. i love my pincushions and magnetic plate to hold wayward pins so i dont step on them! My favorite rotary cutter is the Olfa Quick-Change 60mm Rotary Cutter, followed by my Gingher Thread Snipper. Thank you for the giveaway for your ruler. It looks like a great addition to my collection of rulers. I have a little simple 8″ ruler of clear green plastic. It has 1/8″ marking on one side and 1/4″ on the other and a half inch line down the middle. I find myself grabbing that ruler all the time. I love the Easy Dresden. Would love to have one! HELLO,It is my scissors,could not work with out them! Thanks for sharing a neat ruler! i love Steady Betty, i use it for a whole lot of jobs, on rulers, sewing pedal and of course for pressing. I love my rotary cutter. I couldn’t quilt without it. I love your Dresden ruler and with all the Dresden plate quilts I’ve seen in magazines and on the web, I think I need a ruler to make my own Dresden plate quilt. Thanks so much or the giveaway. My favorite notion for quilting is the rotary cutter. I think Rotary cutter will be a common answer -it’s definitely my favorite. Love, Love, Love all the fun rulers coming out! My rotary cutter would be my favorite notion. Extra fine quilting pins… they make it so much easier to match seams! I love my brass stiletto. So simple, yet so fabulous! Hard to pick just one because I love tools and gadgets…rotary cutter would be way up there, but I probably use my seam ripper almost as much! Thanks for designing the Easy Dresden, it’s another favorite! It’s hard to pick just one but a seam ripper, pins and a rotary cutter are very important. I have several favorite tools but I guess the one I use the most would be my rotary cutter. Today my seam -ripper was my best friend as I unpicked a couple of blocks that a friend gave me to ‘sort out’ because she couldn’t seewhere she had gone wrong. Then I used my trusty flower-head pins to pin the pieces in the correct order and sered on my machine. Definitely my seam ripper! Thanks for the chance to win. Oh heavens, in today’s world of wonderful tools and notions it’s hard to pick just one favorite. I think I’ll go old fashion, since I’m binding 5 quilts, and pick the needle and thread. Who thought to invent a needle? I know it was thousands & thousands of years ago but I’m thankful for the invention and all the improvements to the simple needle. The dresden plate is my very favorite block. thanks. thanks for a chance to win. My favorites and most used are my rotary cutter and mat. The seam ripper a close second. My favorite notion is without doubt my rotary cutter. How did we live without them! I don’t think I can pick just one! To be without a specific tool when I need it is very hard so they each have an important role in my sewing. My favorite notion would be my rotary cutter…makes cutting so much simpler and faster than scissors! I have the EZ Dresden ruler but haven’t had the chance to use it yet but it’s on my to-do-list. Selecting a single notion as a favorite is not easy… I love my rotary cutter but need a ruler and cutting pad for it to work! I love Dresden plate and have used it with men’s ties. They are from my dad’s and other men is our family for grands and great grands. My fave notion has to be my rotary cutter. I’m so bad at cutting with scissors, never manage to get a straight line with them. Good job rotary cutters exist!! I couldn’t live without my rotary cutter and cutting mat! My favorite notion is a magnetic pin holder. My favorite notion is the rotary cutter and mat. I wouldn’t be quilting without them! My favourite notion is my rotary cutter! I have a new seam ripper. It is a delight! I just hope I won’t have to use it too much. My Gingher thread clips are my FRIEND! They are always helping me out of thread jams. favorite notion would have to be the rotary cutter. I don’t think I would get anything done without it. Thanks for the fun. Just have to say I have this ruler and I love it. I’m making a wall quilt with mine. This one is a must have!! My rotary cutter and mat are used the most, but I really like the Clover binding clips. They make binding so much easier. I love my different sized rulers! They make cutting a breeze! I recently thought my favorite notion was my rotary cutter …but….now I have to say some of my rulers that I just bought to make my life easier are my favorite. I would love your tool it would make things EZ. I love my seam ripper and my orange handles scissors – I couldn’t be without them! My rotary cutter. I love Dresden plates, but I haven’t made one yet. I would have to say my Clover binding clips. For years I used office clips & whatever I could find. Now I have my Clover clips in a nice pouch that I made. They are great to use in place of pins. I always say my rotary cutter is my favorite notion because it has brought me back to wanting to make a quilt. I gave up years ago when I realized how time consuming it would be to cut out each piece with a template. Like many others, I couldn’t manage without my seam ripper. I really need some rulers. I would love to work with this one. I’d have to say my rotary cutter, and of coarse need those rulers. I’d love to make a Dresden plate quilt someday and this ruler would help me! I love my rotary cutter – how did we manage before?? My favorite notion has to be my wonderful Rotary Cutter first off!! 🙂 Love my Templates next! Favorite sort of unusual notion is the Clover needle with the hole so I can click in the thread. But rulers and templates can make designing and cutting – and piecing so much easier. Thanks for putting my name in the hat for this drawing! Love my rotary cutter and rulers! Thanks for the giveaway! My favorite is the rotary cutter but I seem to use the seam ripper the most! I’d have to say my favorite is a nice, new, sharp rotary cutter blade. Of course those are most useful with rulers, so thank you for the chance to win this dresden ruler. My favorite notion is my Rotary cutter! It allows me to use great rulers like this one! Sad to say, but it’s my seam ripper! I get a lot of use out of it. Right now, Thangles are my favorite because I have to make a lot of HSTs. My favorite notion is my rotary cutter, which is enhanced by all these great rulers. My most used notion is my seam ripper. Love my Olpha rotary cutter! This would be a lovely ruler to have! Is there anything that can’t be done with a Dresden ruler? I don’t think so, just a simple twist or turn and you have something new to ponder over. Thanks for the giveaway. My favorite notion would have to be my mini scissors. I’m always snipping! My favorite notion is my cutter. I have been wanting to make a Dresden quilt but all the pieces scared me. I would attempt it with this. My favorite notion is my rotating cutting mat! My favorite notion is my rotary cutter and all my rulers. Dresdens are some of my favorite quilts. I am on my way to check out your website! My rotary cutter and rulers, of course. But I don’t have a Dresden ruler, yet! Favorite notion has to be my pincushion/trash catcher that is beside my sewing machine. It even has a loop to hold my scissors. My most used tool besides the rotary cutter is my 6 x 24 ruler, great for cutting strips. A Dresden is on my list of blocks to make someday. Thanks for sharing. besides my radio, my rotary cutter. keeps me focused. Really hard to say which notion is my favorite, but would have to agree with many here the rotary cutter is a must! Thanks for the chance to win.